One of the crown jewels of California is the state park system. California has the largest state park system in the United States, comprised of 280 separate units spanning everything from beaches to the Sierras, deserts to redwood forests. Among the 280 state parks, fifty two are state historic parks, preserving significant cultural, historical and architectural sites for future generations. The state historic parks are as diverse as the state itself, from Anderson Marsh, near Clear Lake, preserving the ancestral homelands of the Koi and Lake Miwok peoples as well as the remains of the Anderson Ranch, to the Woodland Opera House, these parks allow Californians and visitors from around the world not only to learn the history of California but also visit the places where history took place. 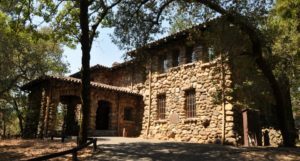 Nestled in the hills above Glen Ellen, in the Sonoma Valley, lies Jack London State Historic Park. While most of the state historic parks preserve historic sites and buildings, only a handful are dedicated to the achievements of individuals and Jack London SHP is one of these. Today, London is remembered mostly as a writer of “dog stories” and his two most popular works, Call of the Wild and White Fang, remain in print and widely read today. But Jack London was more than that. He was a farm boy, an oyster pirate, a fish patrolman, a roustabout, war correspondent, adventurer, sailor, and rancher. A man whose writings celebrated rugged individualism, Jack was a Socialist, concerned about the welfare of the working class and marched with Kelly’s Army. 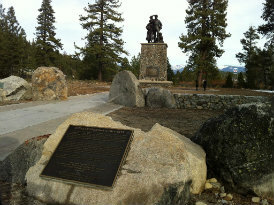 A world traveler, his most memorable stories were set here, in California. A man who valued education, he had a spotty formal education and was largely self-educated. Born into the working class, he became one of the wealthiest writers of his time. Jack London was born as John Griffith Cheney in San Francisco on January 12, 1876. His mother, Flora Wellman was a music teacher and a spiritualist. His biological father, William Cheney, was an astrologer. Jack’s father left his mother before he was born and in 1876, his mother married John London. John became Jack’s step-father. 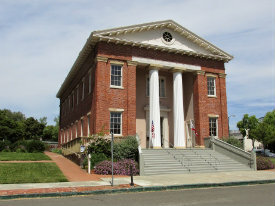 After trying to farm in San Mateo County, the Londons settled in Oakland, where Jack attended grade school. In 1886, Jack began to go to the Oakland Public Library, where he met Ina Coolbrith, a librarian, who encourages Jack to read and educate himself. She would later become California’s first poet laureate. By 1889, he took a job in a cannery and borrowed enough money to buy the Razzle-Dazzle, a small sloop, and began raiding the oyster beds off of Alameda. After a few months, he became a member of the California Fish Patrol, the progenitor of today’s Department of Fish and Game, enforcing the fishing regulations he had previously broken as an oyster pirate. By 1893, London signed aboard a sealing ship bound for Japan, returned to Oakland and had joined Kelly’s Army on its abortive march on Washington DC. Jack had spent a great deal of time studying in Heinhold’s First and Last Chance Saloon in Oakland between 1886 and 1897 and in 1897, the owner, John Heinhold, lent Jack the money to attend UC Berkeley and become a writer. 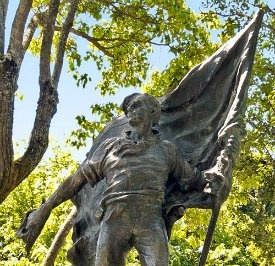 In July of 1897, Jack left Berkeley and joined the thousands of treasure seekers who were part of the Klondike Gold Rush. By the end of the year, he was back in California and his experiences provided material to propel him to success as a writer. In 1900, he was married and by the end of 1902, he was a father to two girls. By 1904, his first marriage was over and he was granted a divorce. In 1905, London married his second wife, Charmian, who was, by all accounts his “soul mate” and between 1908 and 1911, he purchased the former Kohling and Frohler Winery and surrounding parcels in Glenn Ellen, renaming the property, “The Beauty Ranch”. It was here that Jack and Charmian planned to spend the rest of their lives. They moved into an existing house on the property which they named the “Cottage” and began building their dream house, the “Wolf House”. 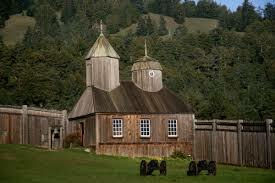 Jack also began to convert the former winery into a working ranch and continued to write. He built barns, pig sties, experimented with various crops and even an artificial lake and bathhouse. He and Charmian entertained and dreamed of moving into the Wolf House. Right before they were to move into their grand house in 1913, it caught fire and burned down. For the next three years, Jack and Charmian lived on the Beauty Ranch, Jack took a job as a war correspondent in Mexico, travelled to Hawaii and dreamed of rebuilding, but that was not to be. Jack died of “gastro-intestinal uraemia” or kidney failure on November 22, 1916. After his death, Charmian built “The House of Happy Walls”, a craftsman style house, as her residence and as a memorial to Jack. She passed away in 1955 and is buried with Jack under a large fieldstone, near the graves of two pioneer children in the park. The exhibits in the House of Happy Walls are currently undergoing renovation and are slated to reopen on November 10, 2018. The ruins of the Wolf House, the Cottage, the farm buildings, Jack and Charmian’s grave site, the lake, and hiking trails throughout the park remain open. GETTING THERE: From 414 Mason Street take US-101 North. Take exit 460A onto CA-37 toward Napa/Vallejo. Turn left onto CA-121 North and continue onto CA-116 West. Stay on Arnold Drive and then turn left onto London Ranch Road. Continue on London Ranch Road to the park entrance at 2400 London Ranch Road.